How to feel better fast — without judgment about your suicidal thoughts. If you’ve ever considered committing suicide or have attempted suicide, you’re certainly not alone. Amazing, strong, and even famous people have done the same. But how can you seek help for your suicidal thoughts, while avoiding the label of having “mental health problems” that could follow you around the rest of your life? When you feel this way, taking your life can seem like the best way to rescue yourself from an overwhelming emotional storm. Maybe you are experiencing unbearable physical pain from an illness or accident or emotional pain so intense it becomes physical. The tightening in your chest. The inability to breathe. And the feeling of suffocating in a world full of air. Your anxiety is off the rails. Your heart races. Panic attacks and depression overtake you and your life feels like a prison of impending doom. On bad days, basic self-care or simple decisions can send you into a downward spiral of panic attacks or emotional shut-down. Your Technicolor surroundings suddenly turn black and white as if someone flipped a switch and turned off your future. And the fear of never having a stable life, healthy relationships, and happiness have you wondering why another day alive is even necessary. You could have already been diagnosed with a brain-based illness or mental health issue. Having felt the weight of the added embarrassment, self-doubt, and shame on top of your fear, isolation, and despair, you’re ready to call it quits. Perhaps you have been to therapists and treatment centers and still can’t get out of your destructive pattern. You might feel the same or even worse from focusing on your problems, which feeds them with energy and makes them even bigger. So, if you have not asked for help, that is completely understandable. But in that case, it means you’re suffering alone — terrified that someone will find out about your thoughts of suicide. But you might feel it’s worth it — because being judged and labeled for who you are and how you feel is more frightening than staying in your own private hell until you can end it altogether. You don’t want to die. You just want to stop feeling the way you do. Most people shy away from someone labeled with a mental health problem, so you wonder what your family, friends, and coworkers would do if they knew what was going on in your head. Would they worry, be embarrassed, abandon you, call the authorities … or hold you closer? The risk feels too great to take, and so you stay quiet about your suicidal thinking. Or maybe you’ve become emotionally numb. You barely recognize the picture of your seven-year-old daughter on your desk. She used to be your life, but now she is just a reminder of the life insurance that will take care of her once you’re gone. You feel like you are on a hamster wheel in perpetual darkness, without the smallest glimmer of sunlight. Or treading water in a dark ocean with land nowhere in sight. Committing suicide would end the anxiety and depression and stop the worries that keep you up night after night once and for all. Yet, even in your darkest moments, you don’t want to be a burden to people who love you by telling them about your suicidal thoughts. You’d hate to cause them to worry, support you financially when you can’t work, or feel like failures for not knowing how to help. So instead, you contemplate how you would commit suicide without leaving a mess or traumatizing whoever found you. Maybe disguising your suicide as a car accident would be more palatable for them? If they didn’t already know you were hurting, they would never find out you were depressed, crazy, or mentally ill. And if they did know your struggle with suicidal thoughts, an accident would free them from guilt. You may even think no one would notice if you were gone. But you don’t really want to die. You just want to stop feeling the way you do, and taking your life seems like the only way out. 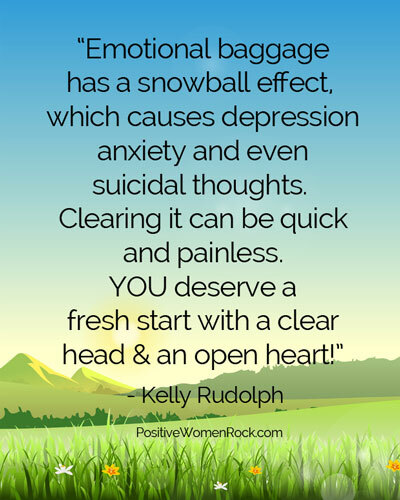 You may have been told that these are signs of a mental health problem, but what if it’s really just your emotional baggage that’s holding you hostage? The feeling of drowning in an ocean of overwhelming pressure is a sign of self-sabotage created by your own mind … and IT’S NOT YOUR FAULT. In a nutshell, your subconscious mind’s number one job is your survival. To protect you by warning you of danger with what you might call gut feelings, red flags, and intuitive messages. And in order to do so, it has to determine what threats to your survival look and feel like, so it relies on its past experience. Your subconscious stores every experience you’ve ever had, in both present and past lives, plus all the emotions wrapped around them. It stores the emotional experiences of your ancestors too, since they’re part of your DNA. That’s a lot of lifetimes of emotions to be carrying around! Whether it’s anger, fear, sadness, joy, love, or happiness, these stored emotions have a snowball effect and get bigger each time you feel them. The positive emotions are great. It’s the negative ones that destroy your confidence and cause problems. You need the lessons learned from negative experiences, not the baggage. When something that resembles a hurtful experience from your past comes up, your subconscious warns you to stay away because “this hurt before.” At the same time, the entire emotional snowball comes crashing down on you! So, rather than experiencing the appropriate or warranted amount of emotion for the current situation, you are experiencing ALL of the emotion from your experience, your past lives, and your ancestors. And that can be overwhelming for anyone. What would freedom from depression, anxiety, and suicidal thoughts feel like? Imagine something that upset you recently and how much emotion you felt about it. How could it have been different if you only experienced half, or 30 percent, or 10 percent of that emotion? Wouldn’t that be easier to handle? Absolutely! That’s how you deserve to live your life. You can, if you heal your subconscious mind and release all that pent-up emotional baggage you’ve been carrying around with the help of a subconscious energy healer. And the best part is it doesn’t take years, months, or even weeks to release the negative emotional snowballs that cause your suicidal thoughts. It takes just a few hours and can even be done over the phone — no mental health stigmas attached. Rest assured, there’s no need to know where the emotions originated (or believe in past lives) to release them. Your subconscious mind has all of that info and will take you exactly where you need to go to heal them up. Trade in negative side effects for empowerment in your life and relationships. 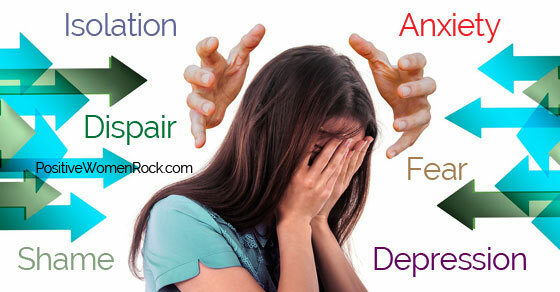 The medications for depression and anxiety can have side effects worse than the issue you’re taking them for. And feeling like a failure is a common side effect when talking about your problems, changing habits, behaviors, and thought patterns doesn’t work. That method is a difficult, never-ending struggle because you’re focusing on the surface when the problem is underneath. Think about it this way: If your car isn’t running well, you don’t get it painted and expect it to run better. You have to fix what’s under the hood. That’s completely possible with the emotions that cause suicidal thoughts. Wouldn’t you rather have side effects like clarity, confidence, peace of mind, happiness, emotional health, and better physical health and relationships? When you release emotional baggage from your subconscious mind that becomes possible. And maintenance is just as empowering as you connect and direct your energy to create what you want. You also learn how to protect yourself from negative people and situations that would otherwise drag you down. This is your life. You can feel better. All you need are the right tools and guidance. 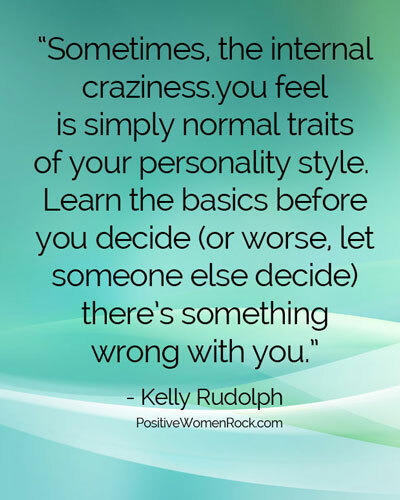 Hi, I’m Kelly Rudolph, Certified Life Coach, Hypnotist, NLP Practitioner, and founder of PositiveWomenRock.com. I guide women to release emotional baggage quickly and easily. Benefit from my 33+ years of extensive training, powerful experience, and consistently high results working with energy and the subconscious mind. Connect with me and get my free Life Strategies here. Click here to Learn How To Take Charge Of Your Life, Success, & Happiness, & Reduce Stress, Anxiety, & Overwhelm in this Free 31-minute training.